View the images for an impression of the rooms in our Bed and Breakfast. 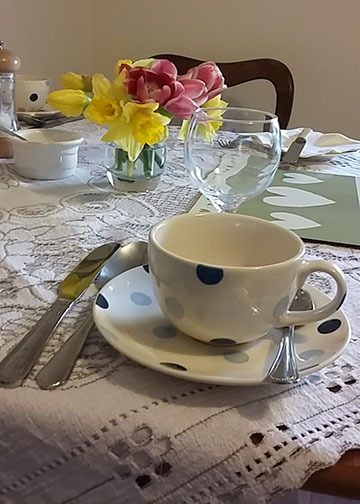 Breakfasts at our small B&B are flexible, we go out of our way to accommodate your breakfast schedule and offer a hearty cooked Scottish breakfast. A basket of fresh fruit is on offer along with a variety of cereals or porridge. We offer good filter coffee and a fine brew of tea. If the above is not what you’re after tell us and we’ll do our very best to purchase provisions to your liking! About our Bed and Breakfast in Auchterarder near Gleneagles, Perthshire.